Recently, something rather shocking occurred in my life. And the whole episode contains an important business lesson about “image rights”. First, I need to quickly mention the Spice Girls, not because I fear they’ve lacked the oxygen of publicity for a while, but because they’re directly relevant to what happened to me. Last year, I was lucky enough to have some photos taken by a top photographer called Umit Ulgen. I used the amazing images he took (which I was delighted with) for various press and media articles I was involved in. But they also led to a rather shocking – or comical – (depending on your point of view) sequence of events coming to pass. I was very intrigued. Print ads? I hadn’t appeared in any lately I was aware of, so I clicked the link. Up popped a page showing a full-page advert for floor tiling. Slap bang at the top of the advert was my face, staring back at me. But it was my face with a slightly shocking, difference. I was all blacked up, as if I’d been up a chimney (in my suit) or back from a commando mission. The strapline for the floor tile advert read, “A Stain On Your Floor Is A Blotch On Your Image”. 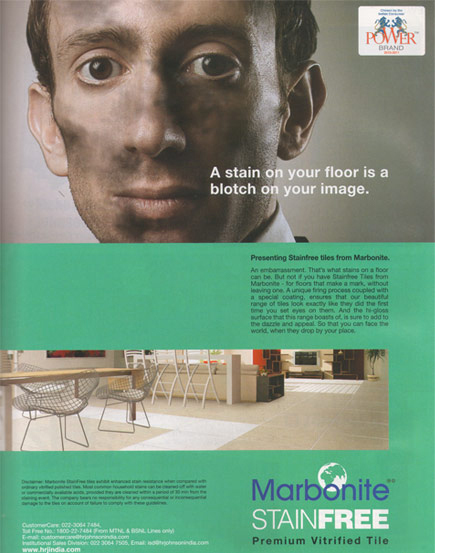 This seemed poetically appropriate given that I knew nothing about my image being used for a floor tiling advert, let alone an image of me that had been photo-manipulated to be blacked-up. A couple of clicks later, I discovered that the image was from a blog on a retailing website that reviewed advertising in India. As I scrolled down the page, I spied the advert complete with my blacked-up face, and a critique of the ad underneath from an advertising insider. “I feel that the product doesn’t get enough attention”, the insider wrote. Maybe that’s because my stolen dirty face takes up half of it, I pondered. I swiftly emailed Umit the photographer and he immediately confirmed that he, too, had no idea about how the image had ended up on the floor tiling advert. In fact, he wasn’t best pleased at all. I imagined his face looking like mine was in the advert, but with the blackness replaced by furious red. To add insult to “image injury”, we then discovered that the manipulated image was also being used on the floor tiling company’s website, amusingly called “StainFree.in”. My family all found this hugely amusing. They joked that the advert was relevant to the fact that I was born in Cardiff. “Shed! You look like a Welsh miner!”, my Mum gleefully emailed. Maybe she was happy because it was the closest she’ll ever see her son get to a proper job. It just goes to show that when you send an image out into the world, or when you launch any creative endeavour for that matter, you can’t have complete control over how it’s used.